found this good online tutorial today. should take a lot of the confusion out of vectoring process for those who want to convert their scans. Process would apply to any program. Thanks for that Steve. Very informative. Jim........Corel draw auto trace works well for what it is. However if you trace even one scroll you will end up with about 5000 nodes do editing it is out of the question.........however you don't have to. Once the picture is down to the actual size it dosn't matter. Cheers and once again, thanks Steve. hay, coin cutter: where can i find out more about this piece of software ? looks like something quite useful to me. This is a good tutorial! Am I right, there is no audio in the tutorial? ...yes, it is a strange name for a vast teaching site, but in fact it is a wonderful site of tutorials on using many different software programs, including graphics and video for both Windows and Mac. You can open it up and check out the style of teaching on quite a few free lessons. They are delivered on Quicktime video streaming, and the teachers are very good. If you want complete access, the cost is $25 for a month...that is about 75 cents a day for 24 hours of teaching if you are an intensive student! You may sign on, and just take a month now and again to do some intensive study. Lessons are in short Quicktime movies of maybe 10 to 20 minutes each as you learn the skills. You can stop and repeat anywhere in the lesson. Lynda Weinman, a Web graphics and design veteran, wrote the very first industry book on Web design, Designing Web Graphics, in 1995. She is a prominent educator and the author of dozens of best-selling books. Weinman was a faculty member at Art Center College of Design in Pasadena, CA, in 1989, and has worked as an animator and motion graphics director in the film special effects industry. Weinman has worked as a consultant for Adobe, Macromedia, and Microsoft, and has conducted workshops at Disney, Microsoft, Adobe, and Macromedia. She has been a keynote speaker, moderator, and lecturer at numerous design, animation, Web design, and computer-graphics conferences. Weinman and her husband Bruce Heavin co-founded lynda.com, a training company with headquarters in Ojai, CA, in 1995. She co-founded the Flashforward Conference and Film Festival, the largest Adobe Flash® conference in the world, in 2000.
better to find simple programs that dont have all the overhead bloat and complexity to do just what you need - there in lies the challange! its always more difficult doing living creatures as people know when you make mistakes. the hardest animal to render on anything with any software package is the infamous human. Had to chime in on this one because I'm a long time linux geek. All my computers are PC's with linux *and* window$ loaded so I can boot up either one. The beauty of linux is it comes with a program called Autotrace. 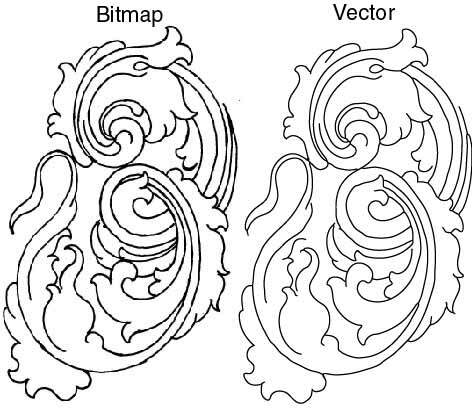 With one simple command you can turn a raster image into a vector image. above is an image of the raster input and vector output. It's pretty efficient with it's use of nodes too Andrew :yesnod: . This is not the perfect solution, but it's the fastest and I think a bit better than Illustrator or Corel's native autotrace functions. If you have the time, and require perfection, tracing the drawing yourself, as in the tutorial mentioned in this thread, is best. Any linux questions I would also be happy to address. Linux is the greatest example of the power of sharing (besides this forum ) on earth! just google "copyleft" or "GPL" and you'll see what I mean. Anyway, I hope that this info is helpful. Lord knows you've all helped me!! Please note that I drew the above freehand from Steve's original just for the heck of it. So if it doesnt look as technically perfect as his, that's why..
Yip, Corel imports ai (Adobe Illustrator) files. I think the biggest thing to keep in mind with all of this is the computer vectorising is only for a transfer to the metal. Not finished artwork in itself. The actual engraving is the finished artwork!!! It's also useful for re-sizing, mirroring, repeating and a few other bits and pieces. Corel, Illustrator, Freehand or whatever, are only tools to get you to a certain stage and carry out certain functions. If the transfer is slightly pixelated or jaggy it dosn't really matter. The most important part is that the scroll backbone provides an acurate line to follow. The more acurate that line is the better the chances are that you can follow it with a graver point. Another thing to keep in mind is that quite often you have to make small alterations on the job (particulary around the borders) when cutting so putting a huge effort into the computer side of things isn't always productive. This is my own personal opinion but I try to get my original pencil drawing as accurate as possible. Everything flows from that original drawing. Scan it a 600 dpi using Photoshop, Corel photo paint or whatever. Create a new layer and with a size 2-4 brush copy the outlines (basically a computerised tracing paper) as acuratley as possible. This is where a Wacom tablet is worth it's weight in gold. Get rid of the origanal scan and save the outlines as a black and white bitmap. Auto trace (Vectorise) with Corel Draw (or whatever you use) Resize to fit. Print/transfer and then engrave. I never try to play with the nodes at this stage as there is no point if the previouse steps have been acurate. From the scanning stage to finish it takes about 4-6 hours for a whole gun. Then another zillion hours to engrave. Last edited by Andrew Biggs; 04-17-2007 at 07:34 PM. I just bought the Corel about a month ago, it is easy to use and has many features used in engraving. The auto trace feature is great and works well as far as I have used it. I’m still learning how to use all the features, but so far a very easy program to learn and a very powerful tool. To address the scroll question, Coral has a Scroll drawing feature, you pick the number of rotations in the scroll, 1,2,3, or 10, any amount you want. Then just make the scroll any size you want and position it where you want. The program comes with 2 tutorials, one video, and the other the standard type as if you were reading instructions out of the manual. The learning curve to get started is pretty short if you use the tutorials. I bought a Wacom Art Pen to use with the program and the program has features that are just for using a pen like that. You can use it to do anything (and more) on the compute, that you can do with a real pen on paper. These pens also work with Abobe Illustrator, in fact a “trial version “of Adobe comes with the pen. i use corel v11, and i've fallen, finally, in love with it. but--- the onboard "autotrace"- well if you can't say sumptin nice, don't say nuttin ! nuff said. supposedly the new trace feature is good, but my money is spending elsewhere right now. i did a neat lettering job 2 years ago on one of those scrolls. 12" in diameter. there was a romantic type inscription starting in the center and winding all the way out to the outer end of the scroll. the job was on brass. if not for corel, i would never have attempted the layout on that job !